Newton, New Jersey January 7, 2019: Donna Price, New Jersey Business Coach, invites visionary women leaders to join her on her show: Visionary Womenpreneurs. employees from the Board Room to frontline operators through creating their own personal vision. She was a forerunner in the early days by personalizing vision when not many consultants were doing that. Her passion and vision as a 33 year-old entrepreneur launched her into Fortune 500 companies in continuous projects without any investment in marketing. That is the power of passionate vision. Today, Janet’s passionate vision remains steadfast while continuously expanding over three decades. Her vision is to get words out around the globe that move people to right action without a lot of effort. She is evolving her 30-year practice into producing words in simple books and on consumer products with the vision of mass distribution around the globe. She takes a word like RESPECT or HONESTY or ACCOUNTABILITY and weaves a language habit into the daily practice of individuals, teams and organizational cultures in a way that moves people to action. Janet may be seen handing a sticker to an employee that says: I have a lot of respect for you. What happens next is the employee instantly responds: I have a lot of respect for you too, Janet. By using simple tools like stickers, placemats, file folders, post cards and Napkin Notes™ Janet gets a lot of words out to a lot of people on any one day that elevate the energy and conversation moving people forward. Her book on NO & YES is an example of simple words with a big message. Donna Price, is a visionary womenpreneur herself, working with womenpreneurs around the world to make an impact on their lives, their communities and the world. Donna believes that women entrepreneurs are a powerful force that keeps families and communities working. Compass Rose Consulting, LLC was founded in 2003 with a mission to make an impact on business success. Women have been meeting and gathering in circles for centuries, perhaps eons. They have gathered to work, to cook, to study, to sing, to share, for rituals, and spiritual journeys throughout time. Some women’s groups at churches were called Ladies’ Circles. Women gathered around the world to change the world through their ability to vote, these women — the suffragettes did change the world. In a circle, there is an authenticity that is shared. When you sit in circle you can see everyone. The hierarchy dissolves or is not evident. Using your voice becomes easier. Women gathering in circles can be an incredible place to be, to do good work, and connect with other women. When you remove the objects in the center as in Whole Person Process Facilitation or Open Space Technology, the energy blocks to healthy exchange are also removed. 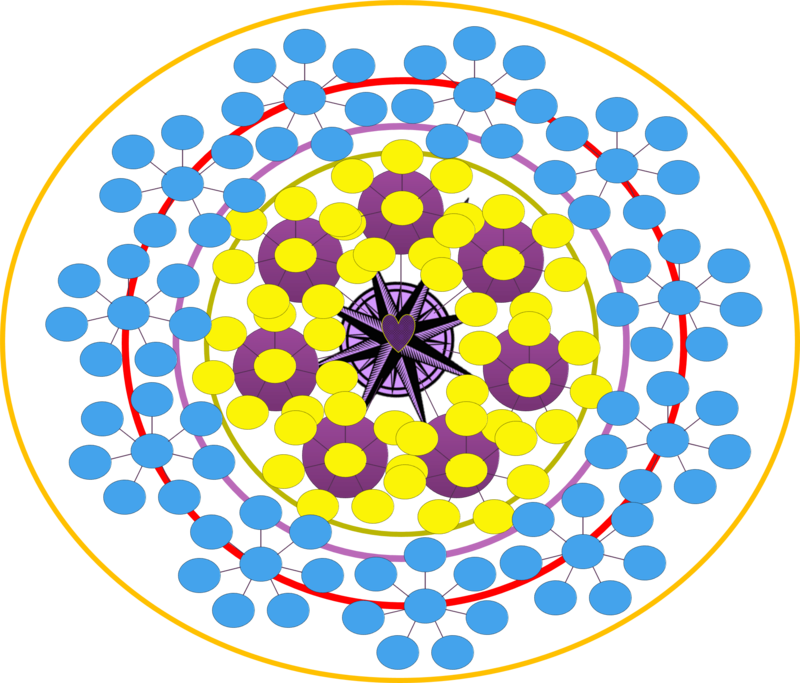 When the center is cluttered with unfinished business, conflict, or even just flowers it affects the energy of the circle and the ability of the circle to be open. Opening a circle, creates a safe space for the people in the circle. It provides a space for people to share deeply, not just on the surface. This is how I envision circles of impact — connecting, expanding, radiating and cascading out. My ability to create the image is limited, but this captures it a bit. In a business circle, this can be powerful. When a group of women business owners come together, passionate about their businesses and connect, then magic can happen. With a group of women, it is even more powerful. There can be sharing, support, input, feedback, connection; that each inspire and motivate the people in the circle. When groups come together in a collaboration space or mastermind space, they start to hold each other up and hold each other accountable. Accountability is one of those words that has become negative. But imagine how your business changes if you are accomplishing all you set out to… and why aren’t you doing that right now? Could someone, or a group of someones help you to do that better. Its accountability. A good thing. It keeps our momentum going. Kind accountability. Inspiring accountability. Now you are soaring. Another thing that happens in a group is the connections that lead to collaborations or idea shares that also propel businesses forward. When these happen… new magic is being developed. Business can be done in isolation. But it is definitely more fun, when there is a group of people that have your back, are on your side, are in your corner and are helping you figure out your path to success. Suddenly, you are no longer alone, wondering if you are making the right decision, or figuring out how to do that newfangled social media. You have a community of women with you. The power of circle work is incredible from both a participant perspective and a facilitator. It is by far the best way to work with groups, have meetings, do strategic planning, visioning, just about any type of meeting is better in a circle. The new Womenpreneurs Mastermind is a community working in circle to change their businesses, their lives and their communities. I believe women will change the world, are changing the world, and will continue to inspire a world based on kindness, love, generosity and compassion. It is getting exciting to imagine the possibilities for each member of the circle, to imagine how they can each impact each other and the world. When women gather — magic happens. New Jersey Business Success Coach, Donna Price, offers Raise the Bar — Strategic Planning workshop for small business leaders to get a head start on their planning for 2018. The New Year is just around the corner and it is not too early to create a strategic plan for 2018. October 25, 2017 Newton, NJ: Strategic planning gives business leaders a road map to their company vision and mission. Often small business leaders do not create an effective strategic plan for their business. Many small businesses are so busy being in business that they fail to plan strategically for their growth and then they fail at executing that plan. The group planning setting also provides opportunities for networking, collaboration, idea sharing and more. Group business settings are rich in knowledge and experience. Effective strategic planning is focused and purposeful, with clear and compelling goals that guide the company forward throughout the year. In addition to the planning session, Donna offers an online goal monitoring system for improving focus and implementation included with the registration fee. Implementing an effective strategic plan results in business growth. Strategic plans that just sit on the shelf and are never reviewed or updated fail terribly. Having a plan and an implementation strategy changes the results that are achieved. The Raise the Bar Workshop featuring the Best Year Yet™ system for strategic planning is scheduled for November 27, 2017 in northwest New Jersey. In addition to leaving with an effective and powerful strategic plan, participants will enjoy beautiful northern New Jersey.